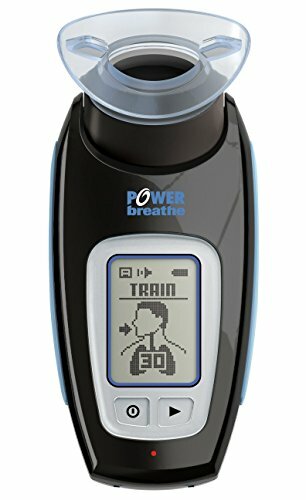 Choose POWERbreathe K4: • For inspiratory muscle training (IMT), testing, warm-up, cool-down, graphical results and Breathe-Link Live Feedback Software • For a max of 10 user/client profiles - 1200 stored sessions per user K4 Features: • Auto-optimising IMT - automatically adapts to your training requirements • Training Intensity - can be set to 'auto' or 'manual' for increasing/decreasing load intensity (cmH2O) • Training Guidance - guides you to breathe at an appropriate rate • Training Results - scroll between results for Load, Power and Volume • Single Breath Test - measures inspiratory muscle strength, peak inspiratory flow rate and inhaled volume in a single breath • Warm-up & Cool-down - automatically sets the optimal resistance for inspiratory muscle warm-up and cool-down • Training History - displays a graphical history of your last 36 training sessions allowing you to review trends and previous personal best results • Breathing Energy - measures the mechanical work of breathing during your breathing session • Breathe-Link Software - Windows and Mac connectivity via USB enables real-time training and performance testing Breathe-Link Software for PC/MAC The K4 is PC and MAC compatible, working on the following MAC OS. It is not compatible with the latest Mac Operating system OSX Mavericks. Mac software will only work for x86_64 bit architecture. Version 10.4: "Tiger" Version 10.5: "Leopard" Version 10.6: "Snow Leopard" Version 10.7: "Lion" Version 10.8: "Mountain Lion". Due to the personal nature of this item it cannot be returned.